Goat anti-human RE1-silencing transcription factor antibody recognizes RE1-silencing transcription factor, also known as RE1-silencing transcription factor variant E1a/E2/E3/N3a/E4i, or RE1-silencing transcription factor variant E1c/E2g/E3/E4. 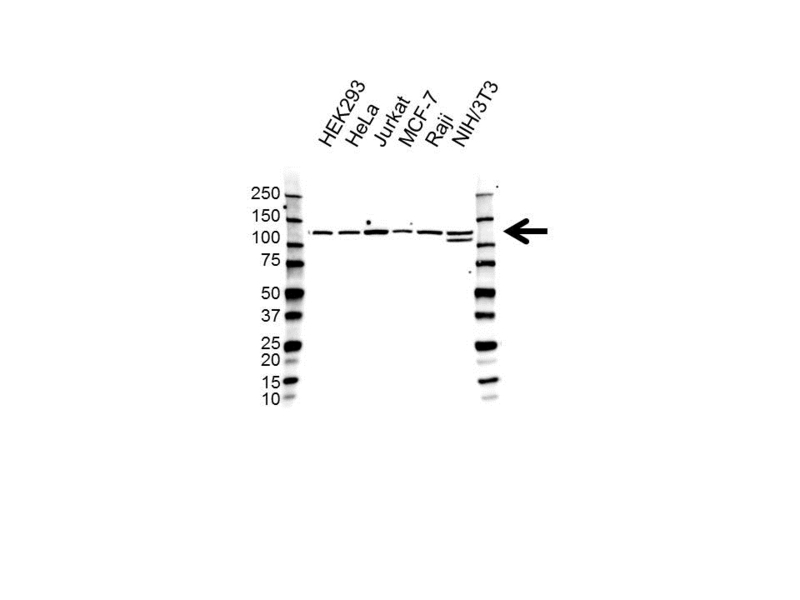 Goat anti Human RE1-silencing transcription factor antibody recognizes the RE1-silencing transcription factor also known as REST, neural-restrictive silencer factor or X2 box repressor. The REST gene encodes a transcriptional repressor that represses neuronal genes in non-neuronal tissues. It is a member of the Kruppel-type zinc finger transcription factor family. It represses transcription by binding a DNA sequence element called the neuron-restrictive silencer element. The protein is also found in undifferentiated neuronal progenitor cells and it is thought that this repressor may act as a master negative regular of neurogenesis. Alternatively spliced transcript variants have been described (provided by RefSeq, Jul 2010). Goat anti Human RE1-silencing transcription factor antibody detects a band of 121 kDa. The antibody has been extensively validated for western blotting using whole cell lysates. Anti RE1-silencing transcription factor detects a band of approximately 121 kDa in Raji cell lysates.